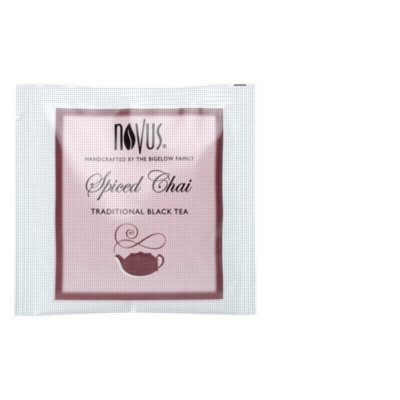 Novus Spiced Chai is bold black tea combined with exotic spices for a traditional Indian-style chai experience! Aromatic and rich with ginger, cardamom, and cloves, this beautifully balanced blend is equally delightful enjoyed as-is, or with milk and honey - as traditionally prepared. It has an exotic aroma and spicy, bold flavor. Recommended steep time: 4 minutes. Gluten free & Kosher. Novus, part of the Bigelow Tea Family, is a new dimension in tea! Exotic, full leaf blends, presented in a unique, pyramid design mesh tea sachet. The sachet allows boiling water to flow easily through and around tea leaves to release their distinct, exceptional flavors. Novus Tea is now Steep Café. You can find Organic Chai by Steep Café, .